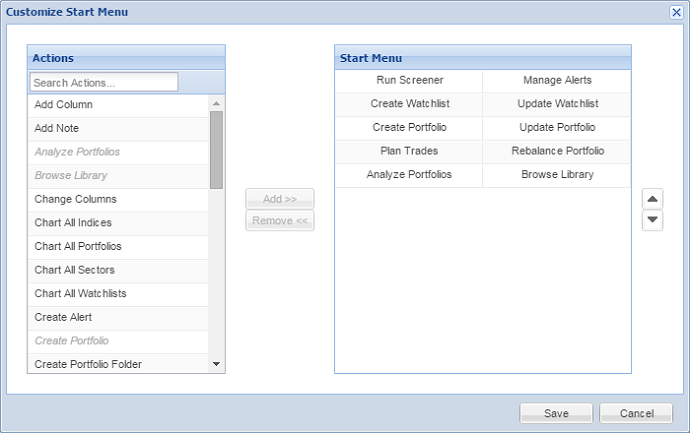 The Start menu, in the top left-hand corner of the screen, is a customizable list of actions that provides easy access to many tasks in Stock Rover. 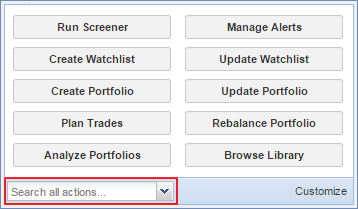 Use it to initiate actions such as creating a portfolio, opening the Investors’ Library, or setting up alerts. Most of the actions found in the Start menu can be accessed elsewhere in the program; however, some, such as opening the Investors’ Library, can only be accessed through the Start menu. On the left, select which actions you want to appear in your Start menu. On the right, use the arrow buttons to set up the order in which you want the buttons to appear. You can make the list as long or as short as you like.